Color: BrassWorks with 2-9/16" (65 mm) Pivot Setback Door Patch FittingsFor 3/8" and 1/2" (10 and 12 mm) GlassLeft and Right HandedThe CRL 135 Degree Left Hand Sidelite Mounted Transom Patch is used to support a transom from a sidelite glass panel. It comes with a INT300 Insert for mounting a door with CRL's PH21A Top Door Patch Fitting. The Insert can also be moved on the non-hinged side, allowing for a double swing door. 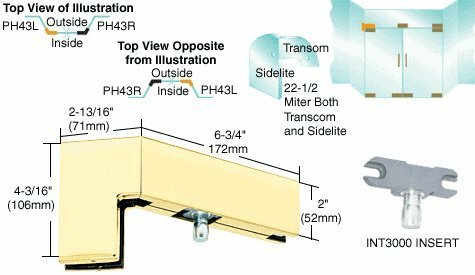 A INT306 Transom Patch Door Stop Insert can be used to create a one way door.GLASS FABRICATION REQUIRED:Three 3/4" (19 mm) Diameter Holes and One Corner Notch; Door is Square Cut; Sidelite and Transom Require 22-1/2 Degree Miters.COMES WITH:Template and InstructionsImportant NotesNOTE: These fitting are not for use with laminated glass.